This past year has been so full of change for me. My life last summer versus my life this summer are completely different, though in all the best ways possible. Even so, sometimes life seems to really sucker punch you in the stomach, and even good changes don’t feel very good at first. That’s also why I kind of stopped blogging over the past year: because I was physically and emotionally overwhelmed. It’s not that I fell out of love with blogging, it’s just that I was so drained that sitting down to write became a chore. Lots of days, I barely had the leftover energy to flick through Netflix, let alone put together a coherent blog post. Not long after my 27th birthday, I finally called it quits on a relationship that, truthfully, had been on life support for some time. I finally just had a couple of moments of clarity that made me go “wow, it’s time to go”. It isn’t easy moving on from something that’s taken up nearly a decade of your life, and even though my heart knew I was making the right choice, I was still conflicted. I spent a lot of sleepless nights crying, debating, and wondering how something could fall apart so easily when I’d thrown 110% of my energy into making it work. The truth, of course, is that life is complicated, and sometimes we get so invested in something that we stop noticing the signs that it really isn’t meant to be. Moving on was hard, but it wasn’t until it was over that it really dawned on me the toll it had taken on my happiness, my mental well-being, even my physical health. I did a pretty decent job of fooling my friends and even myself into thinking I was happy, but inside, I was wasting away. The process hurt on so many levels, but having the courage to finally walk away from something that was not good for me was cathartic. I kind of lost myself for a while in my mid-twenties and I became very self-doubting. But I suddenly felt freer, truer to my self, more fearless about chasing what I wanted and leaving behind anything that felt wrong to me. Again, those positive changes don’t always feel great at first. Sometimes they’re extremely painful. Sometimes I still second-guess myself. Others will second-guess you too. I’ve left behind some “friends” and turned away from paths that once looked really good to me. But over time I’ve realized that saying “no” is one of the simplest, strongest things you can do for yourself. Deciding what you want and what you’re willing to accept—in love, in life, at work, in anything—and sticking to it, is not selfish, it is one of the greatest acts of self-care possible. I’ve had some other positive changes in my life too, some of which I still can’t believe really happened. One of the major things that happened: I bought a house. Yep, I went from struggling month to month paying rent on a series of rundown apartments and houses to becoming a first-time homeowner and fixing up my very own place. It’s been a rollercoaster—the paperwork involved in the home loan process is enough to bury anyone, and the house itself needs a lot of work, which means long sleepless weeks of painting and DIYing and plenty of stretched paychecks. If you had told me a year ago that I’d be writing this post from the comfort of my back porch, surrounded by a new batch of rescued furbabies, content in the summer sunshine, I would have laughed. It didn’t seem like a possibility, especially not before I turned thirty. A year ago I didn’t have the confidence to jump into something so big. And yet, here I am, proof that if you decide you want something badly enough you can find a way to make it happen. It’s not just my outward physical circumstances that have changed. I feel like the past year has dramatically reshaped me as a person, peeling off all the layers that didn’t need to be there and exposing someone new. It’s hard to get into without going into lots of long-winded boring detail, but all of the challenges of the past year have really impacted who I am at my core. Lately I feel so empowered and free, excited to get out of bed each day and greet the world. I’ll probably blog about that more later, but in short, I’ve gone from a place of feeling very depressed and stuck to once more feeling very inspired and energized. In my case it’s true that what doesn’t kill you makes you stronger, because every new challenge and battle has just taught me and shaped me in new ways. I can’t wait to see what the next year holds for me. If you’ve stuck around the blog for the past year—thank you so much for your support. I’m so excited to be back in the blogosphere, sharing all my favorite bookish and food-oriented things, but also just writing more about whatever crosses my mind, be it self-care or current events. And if you’re new here, welcome! I hope you’ll settle in, because I have so much to share. Here’s to change, and to starting a new chapter in my story. I wish I was as brave as you in buying a house but small steps, I think, can lead to big steps. I’m sure there will be even more new adventures that you might not expect. good luck with everything. Changes, while often scary, can be amazing. Happy to see you back doing something you love :) Looking forward to many more posts! 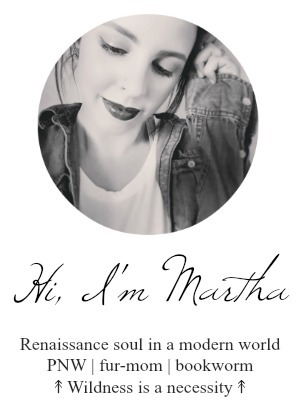 I’m glad you’re back to blogging, Martha!! And YAY for the house…omg that’s so exciting and must be an absolutely amazing feeling to like have your own space to do with what you want. :’) And I’m sorry for you about the ended relationship…that can never be easy. But I hope life is going well for you now, or soon, and this was such a nice post!! Thank you! It’s great to be back!